Mark Wahlqvist's Food and Nutrition is widely regarded as the most authoritative introduction to nutrition and dietetics in the region. It provides a comprehensive overview of nutrition needs at different life stages, the biochemistry of foods, dietary disorders, and the social, political and environmental contexts of food production and consumption. This third edition has been completely revised and significantly expanded to encompass recent developments in nutritional science, technology and policy. It includes new material on genetics, regulation, food production, birth weight, lifestyle and cancer, and the implications of climate change for food production, safety and availability. Chapters are extensively illustrated with data and diagrams. 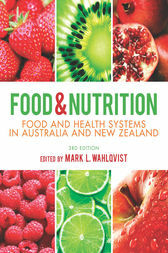 With chapters from leading nutritionists, Food andNutrition is an indispensable student text and a valuable professional reference.